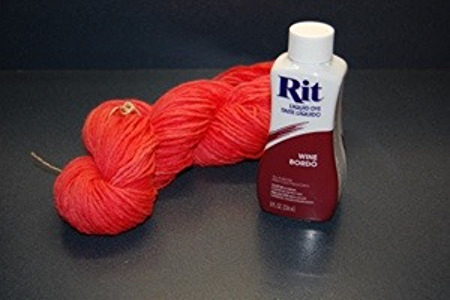 Rit is an inexpensive dye that can be found in the laundry section of grocery stores across America. If you are an average American that wants to dye a piece of cotton clothing Rit is probably the dye you will turn to. I myself have turned to Rit on multiple occasion to dye clothes, and on multiple occasions I have been disappointed with the results. What I had not realized is that Rit is an acid dye, and despite the proclamation on the box that it is suitable for dying cotton, Rit, like all acid dyes, is terrible at dying cotton. To dye plant fibers, like cotton or linen, you would use a fiber reactive dye. To dye an animal fiber like wool or silk,you would use an acid dye, like Rit. 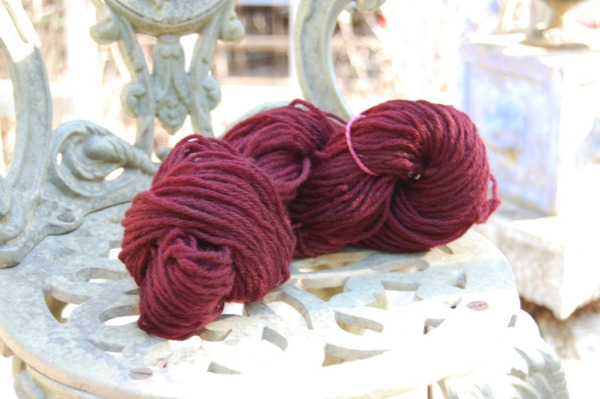 I started with some yarn I had previously dyed with a food safe acid dye. I had not been happy with the washed out red, and decided to over dye it with Rit's dark red wine color. Since I wanted uniform color, I started with a dye pot large enough for my yarn to move freely. I filled it with water, my dye, a cup of vinegar, and my yarn (already wet). Then I turned up the heat. Slowly heat the water to almost boiling, and occasionally move the yarn within the pot very gently. As the dye is absorbed, the water will become lighter in color. When the water is as light as it is going to get (clear if you added just the right amount of dye), and you yarn is the color you want, turn off the heat, and let the water slowly cool. When the yarn has cooled, fill a container with water the SAME temperature as the water in the dye pot, then rinse your yarn. If all of your dye was incorporated you should see little to no color run off. Note: When dying your yarn take care to change temperatures slowly and move the yarn gently. Abrupt temperature changes and agitation of the yarn will turn it into a large felted lump. Also, don't use kitchen implements that will later be used to cook food!